Flyers celebrate the moment of glory. Already crowned the Gardiner Conference champions for the first time in their illustrious history, the Kirkcaldy side were celebrating a remarkable turnaround in their quarter-final double-header with Manchester Storm thanks to Canadian winger Carlo Finucci. 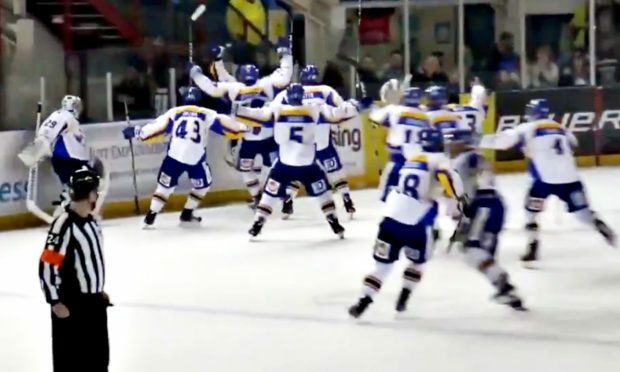 Fife had somewhat disappointingly crashed 4-1 in the home leg on Saturday but 24 hours later stunned the Manchester outfit on their home ice with a superb 5-1 sudden death overtime victory. Dutiaume’s men will now square up to top seeds Cardiff Devils in the Finals Weekend – to be held in Nottingham next week – while Sheffield Steelers take on Nottingham Panthers. Fife hero Finucci had declared in the build-up to the Storm double-header that he did not want to suffer second time round after Flyers crashed out of the play-off quarter-finals last season. But the 31-year-old came up trumps with a goal 47 seconds into sudden-death overtime to take the Kirkcaldy men into the last four. Flyers’ first aim was to get the first goal on the board and they did that inside the opening five minutes when Danick Gauthier found the net. Matt Beca then went close with an effort – he was denied by Andy Iles’ shoulder – then Dan Correale’s backhanded chance forced a save from Storm goalie Mike Clemente. The second followed in the early stages of the second period when a one-timer from Finucci flew into the Manchester net and what seemed unlikely on Saturday started to look likely. Jim Jorgensen tied the aggregate score when he made it 3-0 after his slapshot found its way over Clemente’s stick and into the home net. Patton Conference champions Manchester dealt a blow towards the end of the middle period as Mike Hammond’s shot came off a stick and ended up behind Iles to edge Storm in front once more. But Todd Dutiaume’s side refused to give up and their steely determination was rewarded when they scored again to lead 4-1 on the night but with the aggregate score now 5-5. Liam Heelis was the Fife hero with the fourth goal as the clock ticked down on the third period. And Finucci came up with the goods to send the Kirkcaldy side to their third play-off finals in five years.